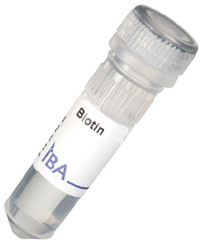 Biotin Elution Buffer BX5 x concentrated comes with a high Biotin concentration for competitive displacement of purified recombinant Strep-tag® or Twin-Strep-tag® fusion proteins from immobilized Strep-Tactin XT. Buffer is recommended for efficient elution in combination with MagStrep "type3" XT beads. Note that after elution with this buffer, Strep-Tactin resin cannot be regenerated.